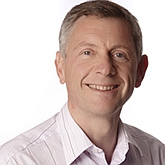 Dr Mark Downing has been a general practitioner at the Rohais Surgery since 1987. He qualified at Westminster Hospital in 1982 and trained specifically to be a family doctor. His interests are general family medical care and child health. Dr Downing has also developed an interest in forensic and legal medicine and has postgraduate degrees in both subjects. He is the lead Forensic Medical Examiner for Guernsey, and is an adviser to the Environment on the medical aspects of fitness to drive. He is married to Liz (formerly Le Lievre) and has five children. Dr Downing enjoys golf, snowboarding, tennis and swimming.